As the World Purrs: Spring is here! Gus: Spring is here! Usually, I'm pretty excited about it. There is a brief period of time once spring is here and before allergy season starts that the Mama opens the windows for me. I love smelling the fresh outdoors! 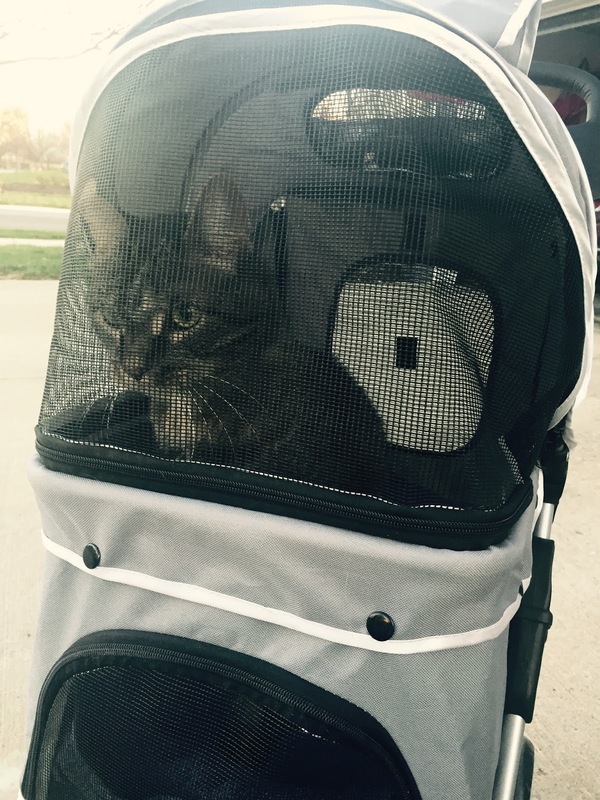 Today though, the Mama took me outside in this contraption called a pet stroller. The Mama had gotten it on clearance a couple years ago. She wanted it for the minions but there are too many gaps where small minions could escape out of it. For some reason, today of all days, she decides to take ME out in it. You look awesome in the stroller!!! I hope you enjoy it and visit outside more! I want to go outside, too - but mom won't take me. She says its still too chilly! Well, if you get to get outside and enjoy the smells then I say GO FOR IT in the stroller! That's a cool way to get outside, Gus. We say give it a chance! oooh, you are a cat on the go! I bet you could even go out and get an ice cream! Gus, DOOD. Let us know how you eventually vote: paws up/paws down. Enquiring Kitties wanna know!